Complimentary room upgrade from a standard to a deluxe room included! Enjoy a complimentary buffet breakfast each morning! Start your day with a delicious meal consisting of locally sourced foods that will provide you with the fuel you need for a day full of activities and relaxing. Exclusive My QLD Holiday tour voucher booklet – save on popular local tours, attractions & activities! Cairns City Sights & Surrounds Tour~*: See everything Cairns has to offer! With this tour you will experience waterfalls, birdwatching, tropical plants, history & culture and much more! We all get a little thirsty while laying out under the sun, right? Thankfully, this exclusive package includes a daily house beer/wine or soft drink per person to keep you cool & hydrated after a long morning of relaxing! One drink just not enough to quench your thirst? No problem! In this exclusive package, you will not only receive a daily drink, but a bottle of wine upon arrival! There’s no better way to start your Queensland holiday! 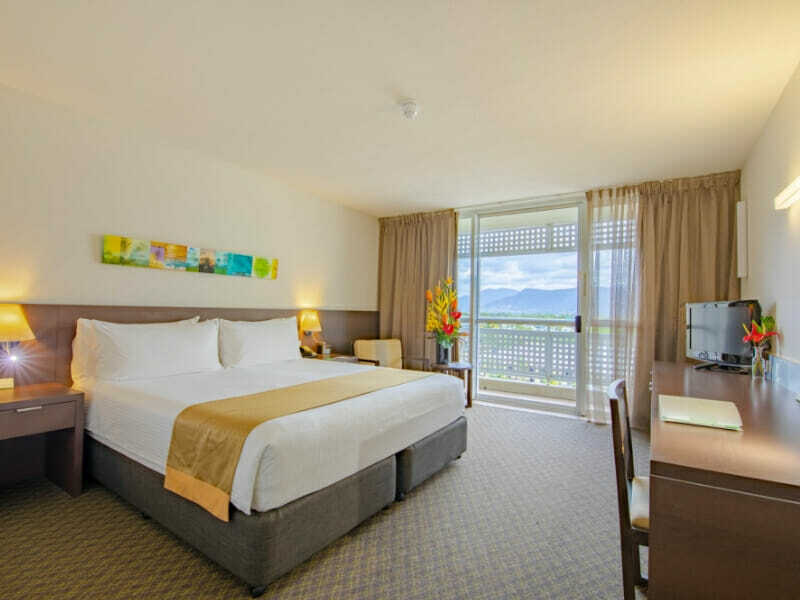 Furnished with a balcony that provides guests with picturesque views of the neighbourhood and Cairns Esplanade Lagoon, the Deluxe Room is like your very own tropical oasis. 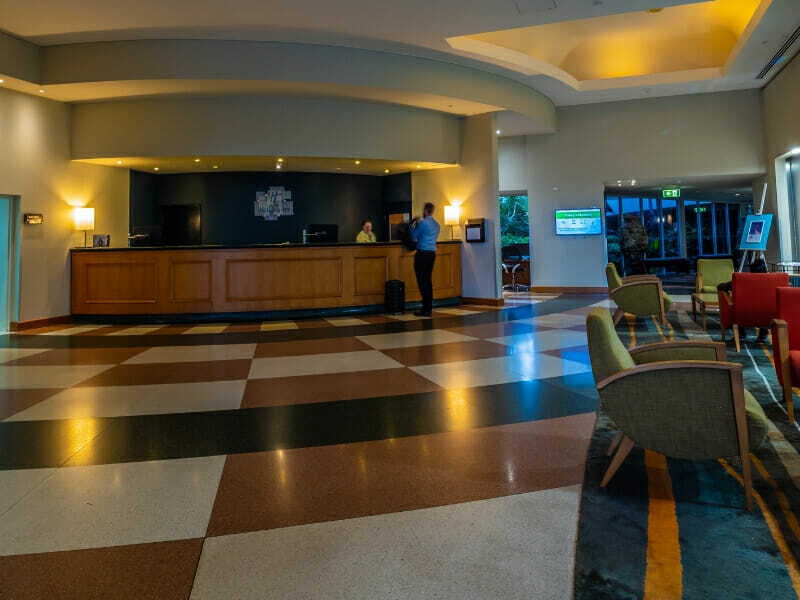 Enjoy direct access to the Cairns CBD when you book this accommodation. This nonsmoking room is fully-functional with a range of modern features. The living space has a flat-screen TV with cable channels and on-demand movies while the bathroom comes complete with a walk-in shower, tub and separate vanity area. Also, expect luxury bedding for maximum comfort as well as top-quality wardrobe, minifridge, minibar and complimentary refreshments. Cots and rollaway beds can be provided for an extra fee. 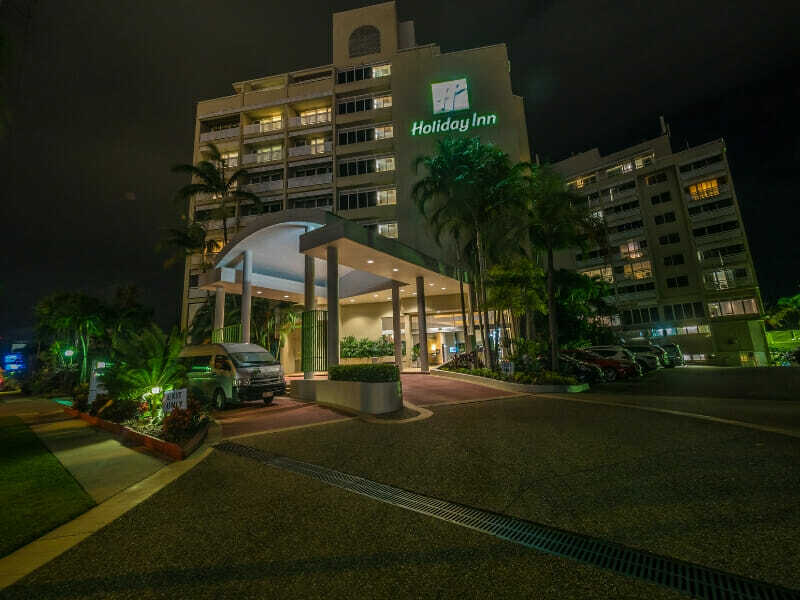 Popular among families and solo leisure travellers, Holiday Inn Cairns Harbourside offers excellent yet budget-friendly accommodation. Each of the 173 well-appointed guest rooms has its own private balcony. The on-site restaurant features a selection of delicious cocktails and hearty meals. Contemporary facilities include a spa pool and well-equipped gym. 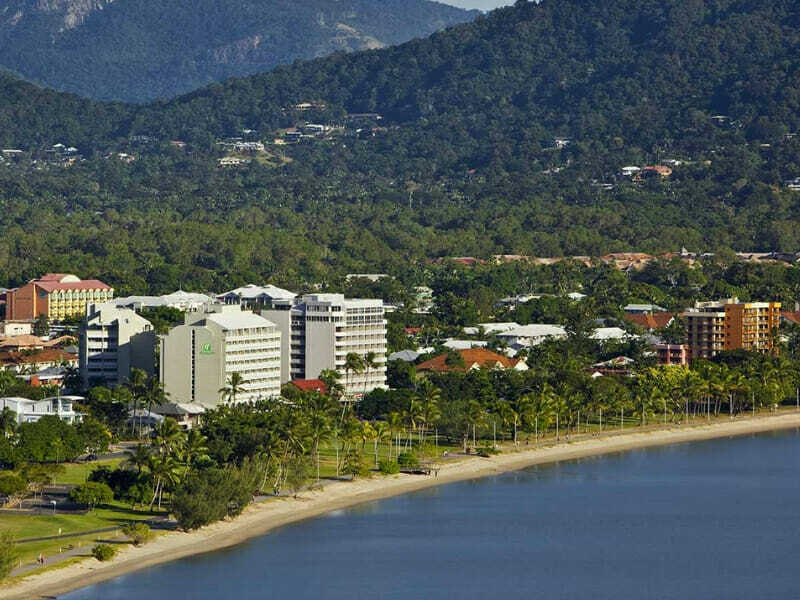 Read more about Holiday Inn Cairns Harbourside here! ^ Airfares are based on the best available airfare at time of publication and are subject to availability & change. Flights may not be direct or operate daily. Air surcharges apply during Australian school holidays and other peak travel periods. Applicable charges will apply for changes. Tickets are non refundable at all times. ~*Cairns City Sights & Surrounds: Cairns Discovery Tours is Cairns’ official city sightseeing tour, in operation for over 20 years. Whether you love waterfalls, birdwatching, tropical plants, history, culture or coast, there’s something for everyone. We look forward to welcoming you on board! The afternoon tour begins at the water’s edge, gateway to the Great Barrier Reef. Travel in air-conditioned comfort with your local guide; step inside St. Monica’s Cathedral where you will marvel at the world’s largest themed stained-glass windows. Explore Cairns and delve into the city’s history. Immerse yourself in the rich cultural heritage that is the Far North. Visit Cairns Museum at the School of Arts Building, in the heart of the city. You will be greeted by a dedicated guide for an exclusive tour of the museum (free re-entry included, valid for 3 days). Continue to Cairns Flecker Botanic Gardens to discover the unique flora of the tropics. Enjoy a guided walk in the gardens before a delicious Devonshire Tea in beautiful tropical surrounds. After refreshments, your guide will lead you back to the air-conditioned vehicle for an exploration of Cairns’ scenic surrounds. The first stop is a scenic city lookout, so have your camera at the ready. Next, visit Lower Barron Gorge National Park and Surprise Creek Falls where there are plenty more photo opportunities. Continue on to Palm Cove, one of Cairns’ most picturesque northern beaches. Walk along the jetty or feel the sand between your toes on Palm Cove beach before the tour concludes. You will be returned to your accommodation in the Northern Beaches or Cairns City at the end of the tour.